Having obtained an honours B. Comm. 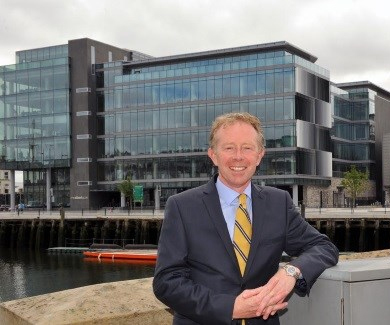 from UCD in 1985, he qualified as a Chartered Accountant in 1989 and was made a Fellow of that Institute in 1999. He is also a member of the Irish Association of Corporate Treasurers and is a Past President of that association. Finally, he passed his membership examinations of the UK Association of Corporate Treasurers in 1993 and was elected a Fellow of that Association in 2003. In total, he has almost 27 years experience in Treasury and Financial Management, working for a number of companies including a US multinational, a UK plc, an Irish Treasury Consultancy. Prior to establishing the Company, he was Group Treasurer of Musgrave Group plc. For the 6 years from 1995 to 2001, he was Group Treasurer of Musgrave Group Ltd., Ireland’s second largest private company, where he oversaw the establishment and development of the Treasury function. During that period, Group turnover grew by 260% both organically and by acquisition from a base of €760m. This resulted in a number of fundraising exercises covering both bilateral and syndicated loan facilities. He was directly involved in the full spectrum of related corporate activity including strategic planning, completion of business cases, bank presentations, facility negotiations and subsequent risk management. In addition, he was responsible for all aspects of interest rate and foreign exchange risk management, cash and surplus fund management for the Irish and UK operations and banking relationships. Since May 2001, he has been Managing Director of Treasury Solutions Ltd. and has already created a niche for the Company in its field of operations – bank funding, interest rate risk and cash management, foreign exchange (FX) risk management, treasury policy and bank relationship management.Clients have been both private and public companies as well as operating in the semi-state and Local Enterprise Office sectors. Clients, in general, would have annual profits ranging from €0.5m up. Funding exercises undertaken to date for clients vary in size from €0.5m to over €700m. Aside from the above, he was a Group Leader in Cork Plato, which is a business support structure for SMEs and he has lectured final year students for the examinations of the Institute of Chartered Accountants in Ireland. He has also written the course material covering Corporate Treasury for the finalists of those examinations and Acquisitions. He is a regular contributor to written and other media on economic and financial market matters. Treasury Solutions was launched in 2001 to provide a niche treasury and corporate finance service to companies who do not have full time professional treasurers but who recognise the need to improve the quality of their risk management and corporate funding. Development of longer-term financial planning models and the drafting of plans which reflect the financial aspects of strategic plans. Policy and Procedures covering all aspects of treasury including interest rate risk management and foreign exchange risk management. Treasury Review covering funding, cash management and foreign exchange practices. Interest rate and foreign exchange strategy formulation and communication. In summary, company personnel has been involved in fundraising exercises exceeding €700 million including some of the largest syndications ever done in the Irish banking market. Risk management (interest rate and foreign exchange) strategies have been developed for over €1 billion of debt. A final measure of the success of Treasury Solutions is the emergence of retainer work whereby corporates use the services of Treasury Solutions on an ongoing basis. We are a large company with a turnover of c.€250m. Initially we used Treasury Solutions to review our treasury policy and procedures to ensure that they were appropriate to an organisation of our size and complexity. Since then the group refunded its entire debt as part of a major acquisition and the advice we received in relation to strategy, bank covenants and facility letters was invaluable. TS have continued to support us through the current financial crisis with pragmatic and independent advice. I have used Treasury Solutions since 2005 for a variety of roles - from the creation of a top class Treasury Policy that is tangible and meaningful, to a review of our treasury function from an Audit and Best Practice viewpoint, to adhoc day-to-day advice and views (on) what is happening in the re-financing market….reliable, consistent and customer-focused; they are very much a part of my decision making process. Since the downturn, I have used Treasury Solutions as a sounding board and to watch my back in terms of banking covenants and funding strategies. At all times, I have found them to be approachable, plain speakers and experts in their area. I think … their fees could have been the best spent money that our company has spent in the last few years. We used Treasury Solutions to assist us with the development of a foreign exchange policy. Their suggestions were practical and well communicated. They understood the subject thoroughly and we will use them again in the future should the need arise. We are an Irish owned multinational company with a turnover in the region of €350m and 2,000 staff. Our treasury function is very complex with a large number of FX exposures and funding arrangements…Treasury Solutions has given invaluable support on a wide range of matters from strategic policy to day-to-day advice….independent, professional and thoroughly competent. John Finn of Treasury Solutions continues to be an invaluable help to us as a small business in our long-term financial planning and in our dealings with financial institutions. In most recent times, his experience and up-to-date knowledge of the financial scene allowed us to be confident of our case in prolonged and difficult negotiations with our main banking partner. Encouraged by John’s tenacity and advice we achieved a favourable long-term result, which will allow us to get back to focusing fully on the running and developing of our business.